When you work with wood as a pro or even as a DIY hobbyist, then it’s pretty clear that you’ll need a miter saw. A miter saw is just too useful and too versatile as you can use it for a large number of projects. And it’s also easy to see why you want to go with Hitachi as your brand, as it’s been in the electric motor business for more than a century. It also has an enviable record for innovation, and in t﻿﻿he ﻿﻿miter saw niche it was Hitachi which came up with the first sliding compound miter saw. But finding the best Hitachi miter saw isn’t going to be as simple. First you’re going to have to determine just want kind of miter saw you really need, and what you can afford. 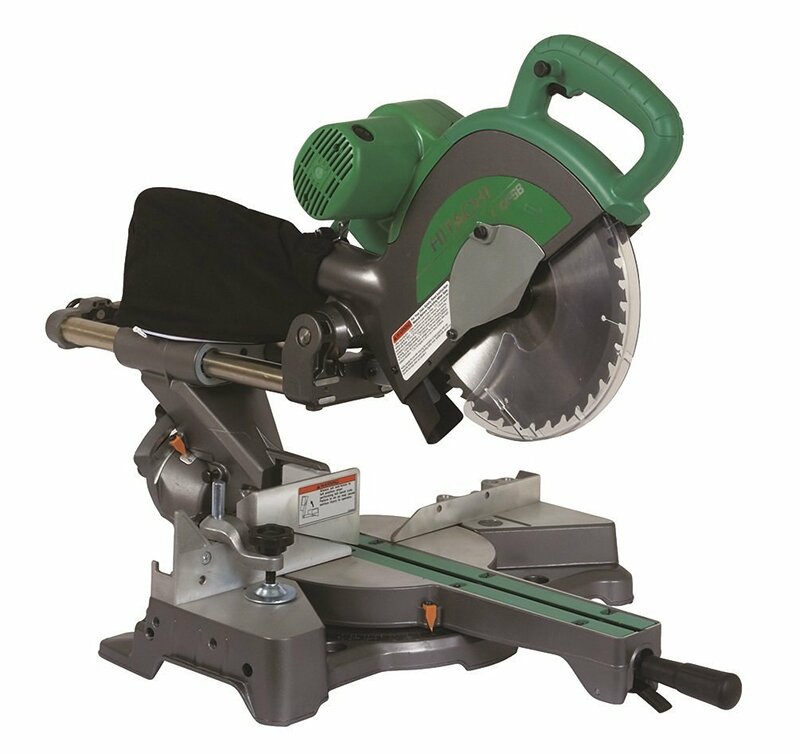 You may also want to make a list of features you’ll like in a miter saw. And then you’ll have to look over the various miter saws that Hitachi offers, and there are a lot of them. Let’s begin with what’s widely regarded as one of the best in the Hitachi lineup. This Hitachi C10FCE2 ﻿Compound Miter Saw is a bestseller among power miter saws online, and it’s not all that hard to see why. Obviously, a large part of the reason for its popularity is the low price. 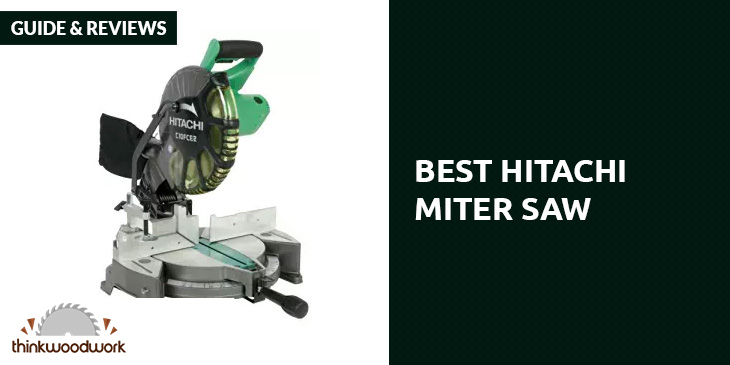 It’s the most affordable among all these Hitachi miter saws even with the laser marker. It’s really cheap without the laser marker (it adds about $50 the price), but that’s not a big deal. Plenty of people don’t really need the laser marker anyway. With this 10-inch miter saw model, you get a 15-amp motor and a miter angle up to 52 degrees to the left and right. That makes it very flexible for many types of tasks. It also features a huge extended flip fence that raises to 4 inches when you want to cut crown molding vertically. You can work on pieces that measure 2 and 5/16 inches high, and 5 and 21/32 inches deep. You also have positive miter stops so you can pick preset specific angles. The bevel range to the left adjust up to 45 degrees, and it also has adjustable bevel stops. The horizontal handle is quite soft and comfy. The elastomer grip reduces the vibration you feel in your hand, so you don’t feel any discomfort. It’s basically very comfortable and easy to control. It also weighs merely 26.3 pounds, making it the lightest 10-inch compound miter saw in its category. It also comes with a dust bag that keeps the dirt from getting into the interior components of the saw. Your purchase also includes a 10-inch TCT saw blade with 24 teeth, vice assembly, and a 10mm box wrench. It also comes with a 5-year warranty, so you don’t have to worry about durability issues. It’s been more than 28 years since Hitachi made the first sliding compound miter saw, and a lot of technological advances have been made since then. Still, the Hitachi C﻿12RSH2 Miter Saw exhibits many features expected from this type of miter saw, as well as newer features too. One striking feature here is the innovative compact slide system. The saw head design doesn’t require any rear clearance anymore, as the saw head now just slides along the fixed rails. The small size of the slide system allowed the designers to cut more than a foot in length from the footprint of the miter saw. This gives you more space for your workshop. 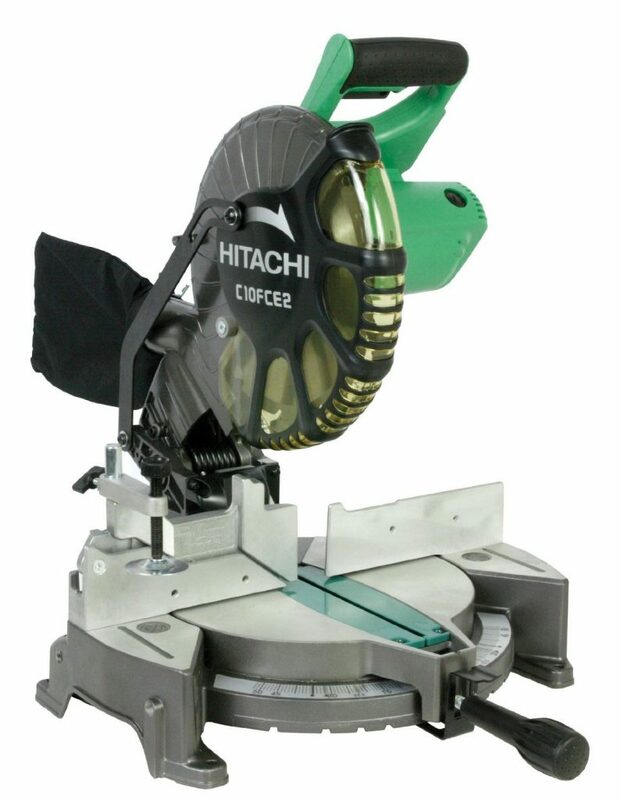 The cutting accuracy is also terrific as Hitachi offers its exclusive laser marker system. This system doesn’t need tools to make your adjustments, so even beginners can make excellent accurate cuts. As for the power, you have plenty with 1850 watts of maximum output power. The large pivoting fence raises the fence height to 4 and 11/16 inches for cutting crown molding vertically. The miter angle to the right reaches up to 57 degrees, while to the left it’s up to 46 degrees. The bevel angle to the left and right goes to 45 degrees, and this means you can just flip the saw blade instead of flipping the work piece. You also get several positive stops on the miter and bevel scale. This makes it easy for you to set your angles, and the measurements are easier to read. This miter saw comes with a vertical handle that’s very comfortable to grasp and nifty to control. The elastomer grip is nicely soft, and it also reduces the vibrations coming through the handle. To enable the miter saw to work for a long time, it comes with carbon brush access. This allows you to replace the brush whenever you have to, which helps prolong the useful life of the Hitachi C12RSH2. Again, the 5-year warranty is in effect. What if you just need a smaller miter saw? Then perhaps you ought to take a look at the Hitachi C8FSE sliding compound miter saw, which measures just 8.5 inches. The 9.5-amp motor is more than enough for a miter saw of this size, as it offers enough power for even tough cutting tasks. The compact design also leads to excellent lightness, as it weighs just 31 pounds. It’s not just easy to control, but it’s more portable as well. The miter angle to the right goes up to 57 degrees, while to the left it is up to 45 degrees. The bevel angle to the left reaches up to 47 degrees, while you also get a 5-degree bevel angle to the right. You have adjustable stops when you need compound cuts. On the miter scale, you also get 11 positive stops, which allows for fast setting and measurements that are easy to read. There’s also a depth adjustment guide, so you can make adjustments fast when your task needs dado joints and a half lap. This miter saw uses a linear ball-bearing slide system. This allows for better control and accuracy for cuts. And you can minimize the risk of accidental cuts with the electric brake, which stops the blade from rotation almost immediately. For additional safety, there’s also a guard that diverts the debris from the work area. There’s also a dust collector attachment to help reduce debris going airborne. It comes with a dust bag, a 10mm box wrench, an 8.5-inch TCT saw blade, and a sub fence. 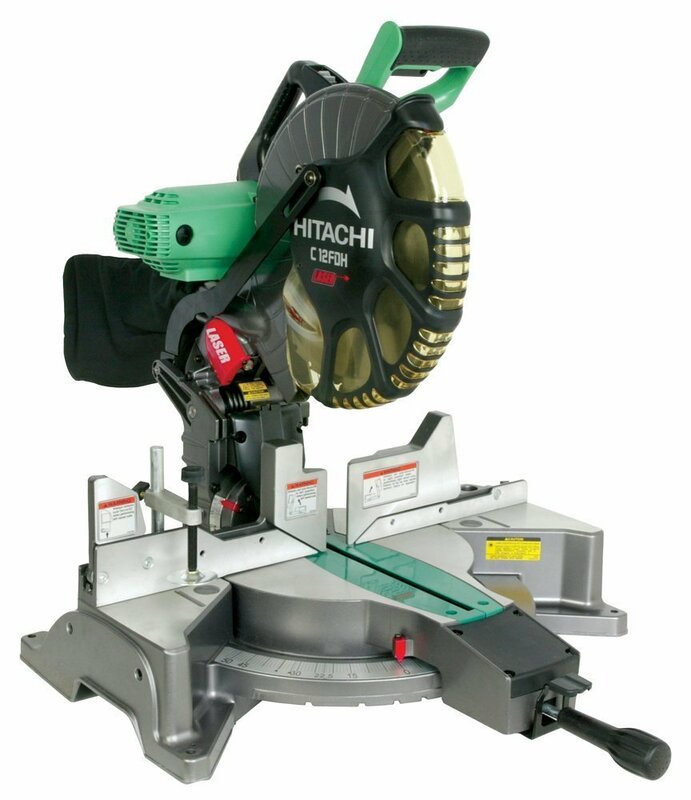 The Hitachi C12FDH comes with a 12-inch TCT saw blade, and powering it is a robust 15-amp motor that produces up to 1950 watts of output power. That’s more than enough for even hardwoods. If you want to cut crown molding vertically, you can do so easily with the large pivoting aluminum fence. It raises the height to 5⅛ inches. It also has a formidable base which improves the balance and support so that your work pieces don’t warp. The miter scale ranges to the left and right by 52 degrees, which allows you a large range of cuts. You can change and adjust the angles very easily with your thumb and the positive stops. For the bevel scale, you get 48 degrees to both the left and right (it’s dual bevel after all), so you can make your opposing cuts without having to bother to flip the work piece. Once you’ve set the major bevel angle, you can use the knob to make your micro bevel adjustments, so you can really get the precise angle you want. The horizontal handle features a coating of elastomer compound that makes it comfortable to handle, as it also reduces the vibration. The surface of the handle also keeps your hand from slipping. The carbon brushes are also easy to access, so replacing them is quick and easy. We end the list with another 10-inc miter saw, but this time it’s 4 times as expensive as the first one on this list. 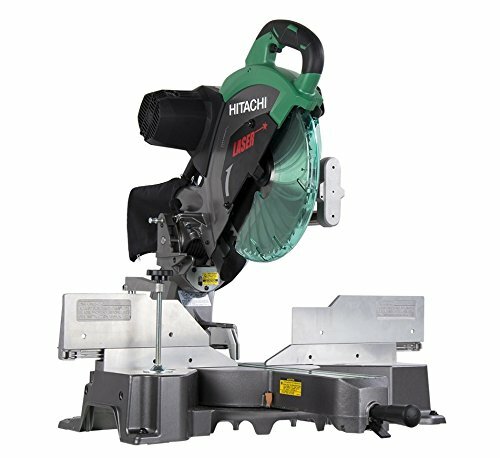 So why is the Hitachi C10FSBP4 compound miter saw so expensive, especially when it has a 12-amp motor and the cheaper Hitachi C10FCE2 has a 15-amp motor? It does come with better features, starting with the fact that this offers a 45-degree angle for both left and tight bevel cuts. So you can just keep the work piece in place while you just easily flip the blade when you make opposite cuts. As for the miter angle, now you have 57 degrees to the right and 45 degrees to the left. You also have positive stops for both the miter and bevels scale. This model comes with advanced features like a soft start function, which minimizes the noise and the recoil. There’s an electric brake too. There’s also an electronic speed control, which maintains the rpm rate while you’re cutting so that you have better control of the saw. The carbon brush is accessible for quick changes, the dust collector system attachment is extremely efficient, and there’s a splinter guard too. With all things considered, it’s not surprising why this is costly. What’s surprising is that at this price range it still offers a lot of bang for the buck. 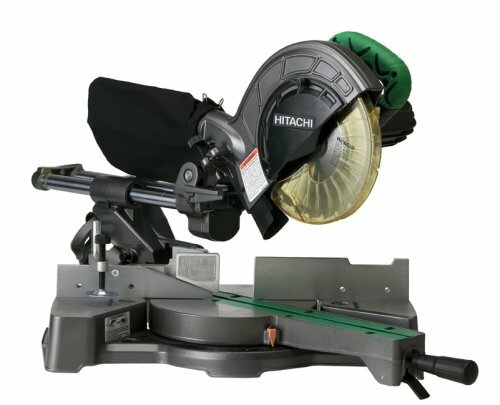 It seems quite obvious that Hitachi has you covered when you’re looking for a miter saw. They have a model that fits your budget and your particular work needs, and they’re all reliable and sturdy. Pick the best Hitachi miter saw for your workshop, and your work can become more productive and more efficient than ever before.